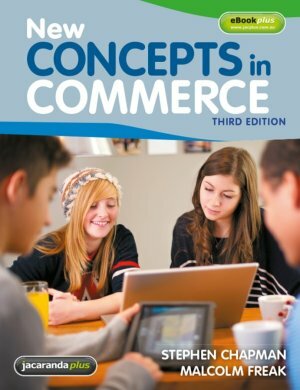 New Concepts in Commerce, 3rd Edition with eBookPLUS follows highly successful earlier editions in addressing Commerce teachers’ needs by providing engaging, up-to-date and detailed content suitable for a range of student abilities. The fully revised third edition covers the four core and eleven option topics from the Years 7 to 10 Commerce syllabus in New South Wales. • syllabus applicability, currency, accuracy, high-interest and relevance to students’ lives. • case studies with linked activities in both core and option topics make the world of commerce come alive for students. • extensive new content on e-commerce includes online shopping, m-commerce and use of financial and shopping-related apps. • new material on Fair Work Australia, changing work patterns, modern awards, National Employment Standards and legal issues in the workplace. • new civil and criminal case studies. • updated economic data along with coverage of the Global Financial Crisis and European Debt Crisis. • includes children’s advertising, invasion of privacy, Coca-Cola target markets and targeted product range, and advertising. • Glossary terms and definitions in context, use of dot points, graphic or visual displays, and careful grading of activities allow for differentiation of learning. New Concepts in Commerce 3e and eBookPLUS is a hard copy of the student textbook, accompanied by eBookPLUS electronic version of the textbook and a complementary set of targeted digital resources. These flexible and engaging ICT activities are available online at the JacarandaPLUS website. • Access from any digital device PC/MAC/iPad/Android Tablet.